Can gluten affect Lyme disease? A gluten-free diet can be used to treat a myriad of conditions, though not everyone responds positively to these dietary changes. Gluten represents a larger-size protein molecule that can be difficult for many individuals to break down effectively. When poorly digested, gluten can cause some degree of inflammation in the body, whether in the digestive tract or in other bodily systems. For this reason, a gluten-free diet is sometimes used to treat Lyme disease with varying degrees of success. The link between a gluten-free diet is not well established and Lyme patients should be resonable regarding their expectations. There are no documented studies providing a clear link between gluten-intolerance and Lyme disease. The use of a gluten-free diet for conditions such as Lyme relies on theoretical science and patient testimonials. As an article by FoodRenegade.com points out, alleged cases of gluten intolerance and gluten-free dieters are on the rise, but the actual amount of medically-confirmed celiac patients reveals a minimal number. This is not to say there are no benefits to a gluten-free diet, even if an individual does not suffer from celiac disease or true gluten intolerance. A lack of research suggests a gluten-free diet should never be used as a sole treatment for Lyme disease and other severe illnesses. However, some patients do feel better eating a gluten-free diet and this could be for a variety of reasons. A classic bulls-eye rash. Visuals of this rash are available at the Mayo Clinic website. Lyme disease is not always easy to diagnose conclusively, but it is treatable with antibiotics. 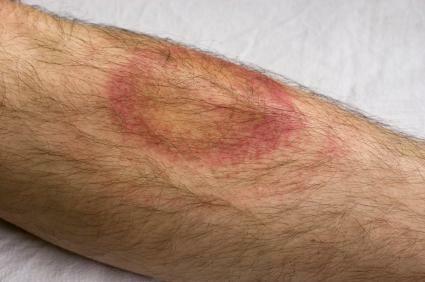 However, not all patients experience a full recovery from Lyme. In fact, a number of patients do not recover smoothly and may engage in a lifelong battle of mysterious syndromes and medical issues. These patients will often resort to alternative treatments and dietary measures to improve their symptoms. A gluten-free diet is one of several hypothesized treatments to mitigate symptoms, but some patients may respond well to a gluten-free diet, while others not at all. A gluten-free diet may improve the symptoms of Lyme disease for many reasons. First of all, gluten-containing products are often high in carbohydrates. Carbohydrates result in bursts of insulin and a high consumption of carbohydrates can lead to type II diabetes at times. Lyme patients who suffer from insulin resistance or blood sugar issues may reap the benefits of a gluten-free diet simply because they may now be consuming less processed grains and carbohydrates. This point is further emphasized by an article entitled "Nutrition and Lyme Disease", published in the Townsend Letter. Additionally, gluten is also a difficult molecule to digest. When it is digested poorly, it can result in inflammation throughout the body. For this reason, gluten-free diets are recommended for numerous auto-immune disorders such as Lupus and rheumatoid arthritis. Though gluten does not necessarily cause such disorders, its elimination from the diet may help to lower inflammation levels, thus granting the patient some relief. Lyme disease causes inflammation. It can lower the immune system and make an individual prey to all sorts of secondary medical conditions. It may possibly also trigger immune activity, making the body more susceptible to celiac disease. Eliminating gluten from the diet, and sometimes casein-containing dairy products, might help to combat unnecessary immune activity and reduce inflammation. Again, there are no studies that can confirm positive results regarding Lyme's treatment with a gluten-free diet, but if you suffer from Lyme disease and experience a lessening of symptoms through the removal of gluten from your diet, then there is no need to reintroduce gluten. If you suffer from Lyme disease and do not feel treatment is working, talk with your doctor about trying a gluten-free diet. Gluten is not an essential nutrient. Removing glutinous grains from your diet will not result in dietary deficiencies, particularly if you are eating a diet balanced in the areas of fruits, vegetables, and quality sources of protein. Hence, in most cases, attempting a gluten-free diet should not harm your body negatively. Lyme patients who desire to try this diet may, at the worst, experience no change in health whatsoever. Lyme disease, however, can cause weight loss in some patients. Individuals who suffer from chronic weight loss or indications of malnourishment must ensure that they consume an adequate amount of calories while on a gluten-free diet. Assocation Between Celiac Disease and Candida By Erin Coleman, R.D., L.D.